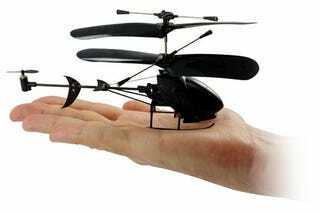 The guys at Think Geek are bringing R/C junkies one of the cheapest 3-channel mini choppers on the market with the new "Black Stealth." Unlike dinky 2-channel versions, the Black Stealth can handle forward flight with ease—or so they claim. In fact, Think Geek goes so far as to say that it is the easiest to fly small copter they have ever used. I would be kind of skeptical with a price tag of only $30, but the video below does a good job of showing off its capabilities.